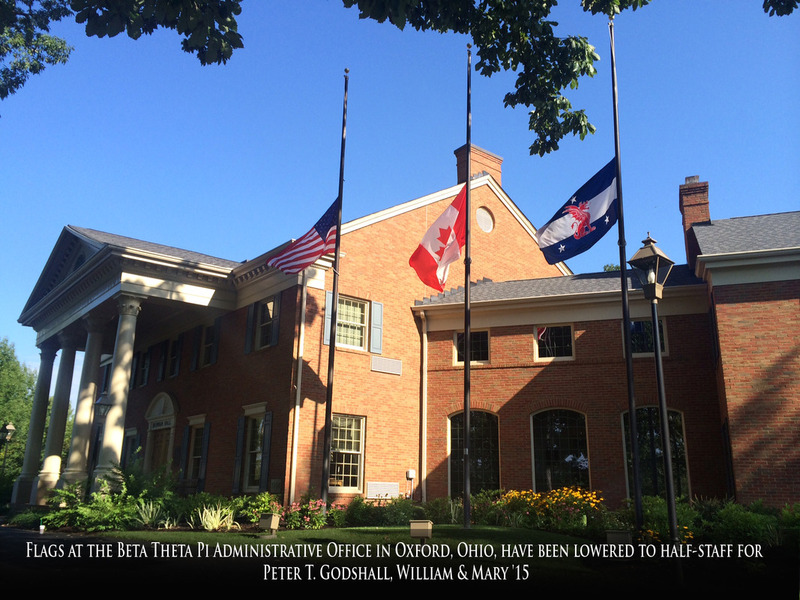 The Fraternity is disheartened to share the passing of Beta undergraduate Peter T. Godshall, William & Mary '15, who apparently took his own life in the early morning hours on August 25, 2014. A rising senior with a double major in history and finance, Peter was president of the club lacrosse team last semester and had served his Beta chapter as vice president of programming and recruitment chairman. Born on May 28, 1993, and a native of Chadds Ford, Penn., Peter is survived by his loving parents, Sheridan Black and Scott Godshall, and younger brother, Malcolm. We understand that a scholarship is being established in Peter’s memory at the Tatnall School. More information about the scholarship will be included in his obituary, to be posted tomorrow through Sunday atwww.delawareonline.com. The family has requested that no flowers be sent. Our thoughts continue to be with Peter’s family and friends during these very difficult days.